Donate $5 to our Charity and I’ll get you a ZIP file with the full manual or just the pages you need to view offline. In the top box enter B12 and then any other 10 numbers, then click the login button, This will bring you to an online Chilton's manual. You might have to try a couple of times. When you get the pages you want, download/print them out for convenience in case you can't access the site when you really need to. 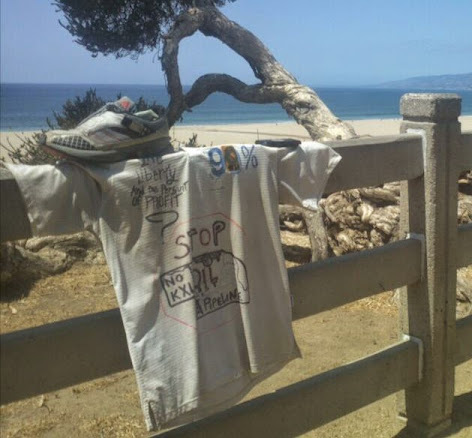 *They have connected this to a database that confirms actual DL #s in 2014 so it is a crap shoot to guess a legit DL # now. *as of 2014 you have to login with a user account to access the archives. Often there is an error accessing the archives. Check to see if your problem qualifies for a free recall repair! The most common one of RAM’s are the related to front suspension vibration. PROBLEM: ABS trouble light always on. DETAILS: my van has no fuse wiring contacts in the #5 ABS fuse slot. I do NOT have access to a manual to check if I have 4w ABS but by inspecting the front wheels and seeing NO SIGN OF WIRING I am certain I have only rear wheel ABS. SOLUTION: 1.) Forum chat says that bleeding the brakes has succeeded in removing the trouble light. 2.) if trouble light remains on after bleeding, then try replacing relay; then try replacing the sensor on the rear differential. Some say there is no ABS relay on the mid 90’s Ram Van’s but the part stores list ABS relays in their parts options. There is talk that the brake lines above the fuel tank are connected with rubber hoses that crimp or deteriorate and leak. If bleeding turns the dash lights off temporarily then they come back, it is likely the hoses have a leak. *currently researching manuals to find out if the ABS fuse was an UPGRADE/OPTION on the 1995 Dodge Ram Van Mark 250. 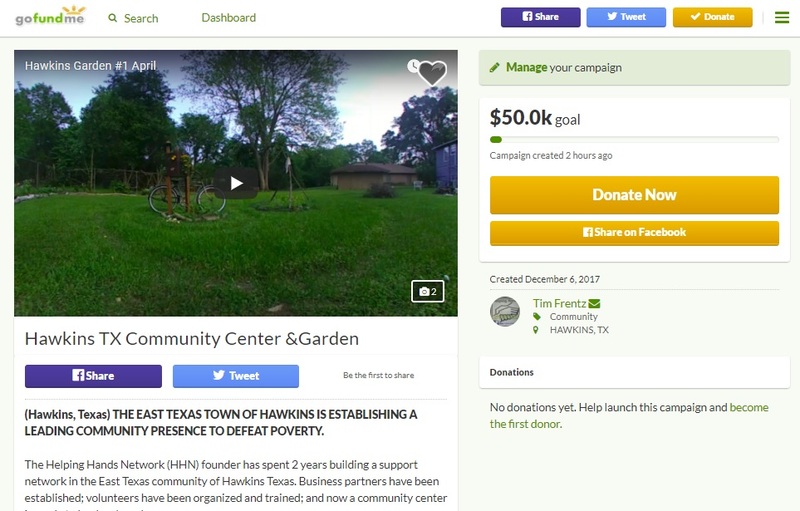 If you know more about this please msg me or comment on this post. PROBLEM: my front right brake locks up after about 30 minutes of highway driving. Sometimes it randomly does it while driving around town. PROBLEM: When the weather temp is near 45f or lower, my fuel pump relay is not working properly? DETAILS: I engage the starter and force the fuel pressure to rise for 5 seconds. I then leave the ignition on but do not engage the starter. Depending on the surrounding temp, the fuel pump relay will take several minutes before it starts making a ticking sound and the check engine light flickers for another 1-5 minutes. Once the ticking and check engine light stops flickering, I engage the starter and the fuel pressure is high enough that the engine turns over but very roughly. I gently press the pedal to keep the fuel pressure up until the engine idle balances out. When it is below freezing the relay doesn’t ever start ticking without a heat blower placed on it. SOLUTION: This is an ongoing problem. Checked and cleaning all electrical contacts. Found a blown 15amp fuse under the dash near the steering column in a blue fuse holder. (there are 2 of them; a 20amp and a 15amp) I replaced the 15amp with a 40amp to prevent it from blowing hopefully. I unplugged the battery and computer; turned the key to drain any reserve power; waited 2 hours and put everything back together. Problem still remains! I also hooked up my truck with jumper cables to give the battery extra amps to make sure the cranking power on the van’s battery is not the issue. I am now tracing the wiring back to the fuel pump and thinking of dropping the tank to check the connections on the pump. I replaced the pump 30,000 miles back so it should still be good. Now it is 30 degrees out and I can not get the pump relay and circuits to activate the pump even with blowing a hair dryer on the relays. AND I really need to get it going to park it in storage. Next spring I think I will waste the $90 to have the PCM sent in for testing so I can eliminate it from the scenario. I am about to pull my tow package off and sell the van for parts. I got $425 in new rubber, new upper gaskets and tuned valves, newer fuel pump, new plugs/wires/distributor, new timing sensor, new filters, new radiator, new water pump and new brake pads and I’ll be lucky if I can get $750 for it if I don’t solve this starting problem. Problem: Radiator Hose broke. Engine over heated. Likely broke/warped/cracked the head/s and/or gasket. Solutions: AFTER replacing the radiator hose, testing the water pump, replacing the thermostat…. the engine still over heats after a short while… Identify the problem by checking oil for signs of radiator coolant. If the gasket and/or head is cracked, the wall between the oil system and cooling system is being penetrated and one or the other or both will be mixed together. IF the fluids are mixed proceed to solution #1 Compression Test. You will read about how “oil in coolant” vs. “coolant in your oil” is very important to clarify. One means possible BLOCK damage and total replacement vs. ONLY head damage and replacement. Big cost and time difference. 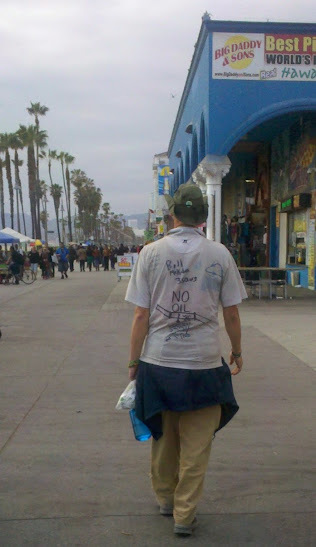 I’m still not sure how can you tell and looking for a better answer to post here? 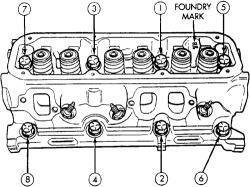 #1 Test the CYLINDER HEAD VALVES for compression loss/cracks and THEN replace if needed. STEP 3: disable the fuel injectors by putting the throttle pedal down and pull the fuel pump fuse/relay. Listen to make sure the pump is not powering up when the key is turned. STEP 4: crank starter 5+ times to reach max compression rating. STEP 5: Un-thread tester and drop oil on valve and thread back in and re-test. Note down each reading. Should be a +20-40psi range. STEP 6: Do this for all cylinders and compare readings. IF there is a cylinder losing compression move on to STEP #7. If you have mixed fluids there is definitely a compression loss. STEP 7: Connect air compressor straight to the cylinder and listen for air loss. IF there is air coming out of the side of the head, you have a crack OR if air is coming out of the connecting gasket area, move on to SOLUTION #2. IF leaking is heard in Oil Cap there are broken rings, if heard in tail pipe or throttle plate manifold the bottom of engine is damaged and needs to be pulled out of the vehicle. 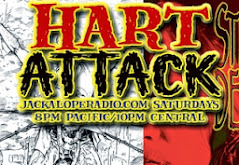 Generally, cracks are limited to the combustion chamber, however, it is not uncommon for the head to crack in a spark plug hole, port, outside of the head or in the valve spring/rocker arm area. The first area to inspect is always the hottest: the exhaust seat/port area. A visual inspection should be performed, but just because you don’t see a crack does not mean it is not there. Some more reliable methods for inspecting for cracks include Magnaflux®, a magnetic process or Zyglo®, a dye penetrant. Magnaflux® is used only on ferrous metal (cast iron) heads. Zyglo® uses a spray on fluorescent mixture along with a black light to reveal the cracks. It is strongly recommended to have your cylinder head checked professionally for cracks, especially if the engine was known to have overheated and/or leaked or consumed coolant. Contact a local shop for availability and pricing of these services. TESTING should cost <$15 each. AFTER identifying if there is a compression loss OR if your gaskets were just blown out you can begin the proper repairs. 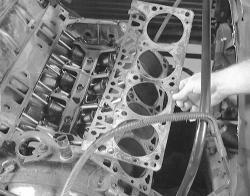 #2 Replace head gaskets with MULTI LAYERED STEEL gasket (MLS). IF all cylinders fail compression test, then check the cylinder head/s for plum by laying it on a glass window. IF it is warped, you can sand it or have it refaced for $100/ea. on average. IF head is severely damaged, get a NEW replacement head for $250/ea. on average. Don’t waste time with refurbed $175 heads. The casting is thinner and has already been weakened. Watch this video series by Chrysler MasterTech to be familiar with your Head Cylinder cover. – Disconnect the negative battery cable. – Remove the air cleaner assembly. – Remove the distributor cap and ignition wires and label them. – Remove the heat shields. – Disconnect the fuel line(s). – Disconnect the accelerator cable, speed control cable (if equipped), and transmission kickdown cable (if equipped). – Label and disconnect the coolant temperature sending unit. – Label and disconnect the heater and bypass hoses. – Label and remove all the necessary vacuum lines. – Make sure all necessary electrical connectors and vacuum lines are removed and labeled. – Remove the valve covers. Remove the ignition wire separators from the studs on the valve cover. Remove the PCV valve and hose from the valve cover. Remove the bracket on the cowl-to-radiator support brace that retains the oil fill tube. Remove the oil fill tube by twisting upward.Note the bolt and stud locations prior to removing the valve cover. 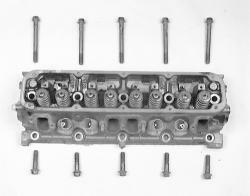 Remove the retaining bolts and studs from the valve cover. It may be necessary to tap the valve cover slightly with a soft mallet to loosen; do not pry on the valve cover. Remove the valve cover from the cylinder head. – Remove the intake manifold, with the throttle body attached. I will post the most important ones below. – Mark and remove the rocker shaft assembly (if equipped), or the rocker arms and pivots. – Remove the exhaust manifold(s). – Remove the head bolts in a star pattern to not damage the gasket and give you an accurate visual of the pre-existing damage. 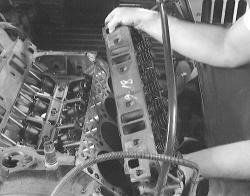 – Lift the cylinder head(s) off of the engine block. Place cylinder head on a glass surface. IF head is warped here is a demo video of how to sand it. You can spend $100/ea. to have it pressure tested and refaced at a shop. I recommend, just purchasing new headers on eBay for around $175/ea. Examine the bolts for “stretch” with a flat rule. If there is nothing out of the norm, you can reuse these. – clean the head and block with solvent or gasoline and blow dry. IF you need to replace the heads, you will want to buy a head with valves pre installed. IF for some reason you need to remove and re-install the valves and springs… see my NOTES blog for further detailed instructions. – Refer to cylinder head cleaning and inspecting before installing. 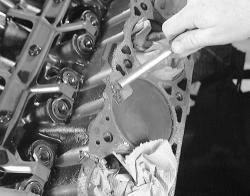 – Position the new cylinder head gasket(s) on the engine block. 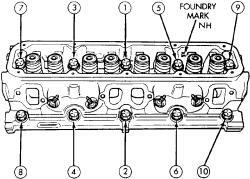 – Place the cylinder head(s) onto the gasket(s) and engine block. – Tighten, in sequence, all the head bolts to 50 ft. lbs. (68 Nm). Repeat procedure, tightening the bolts in sequence to 105 ft. lbs. (143 Nm). – Install the pushrods and rocker arm shafts or rockers and pivots in their correct positions. Tighten rocker shafts (if equipped) to 200 inch lbs. (23 Nm). Tighten rocker arms (if equipped) to 21 ft lbs. (28 Nm). Rotate the engine until the “V” mark lines up with the TDC mark on the timing chain cover. This mark is located at 147° from the No. 1 firing position. Install the rocker arm and pivot on the correct cylinder. Tighten each rocker arm retaining bolt to 21 ft. lbs. (28 Nm)4. You may need to rotate the engine to make additional adjustments for any excessive slack/play in rocker. You want up and down play for lifter clearance but not side to side slack. – Install air intake, injectors (if removed for testing) and throttle body. – Install the intake manifold. – Install the valve covers. – Clean all gasket mating surfaces thoroughly. – Lubricate all bolt and stud threads prior to installation. – Install a new valve cover gasket on the cylinder head and align the fastener holes. – Install the valve cover on the cylinder head. Although the manufacturer does not specify a torque sequence, it is recommended that you start from the center and work your way outward, alternating sides of the valve cover. Remember to tighten evenly to prevent valve cover distortion. – Install the retaining bolts and studs, and tighten to 95 inch lbs. (11 Nm). – Install the ignition wire separators on the valve cover retaining studs. – Install the oil fill tube back into the valve cover. – Install the bracket on the cowl-to-radiator support brace for the oil fill tube. – Install the PCV hose and valve into the valve cover. – Connect the negative battery cable. – Check the engine oil level. – Replace the vacuum hoses to their correct locations. – Replace all electrical connectors in their correct locations. – Install the heater and the bypass hoses. – Connect the accelerator cable, speed control cable (if equipped), and transmission kickdown cable(if equipped). – Connect the fuel line(s). – Install the heat shields. – Install the distributor cap and ignition wires. – Install the air cleaner assembly. – Refill with the proper coolant mixture, and bleed the cooling system. – Install the engine cover. PROBLEM: Acting like transmission is slipping. #1 Check fluids and Replace or clean fuel and air filters. #3 Replace fuel pump in tank. How do you identify if the head/s are damaged or just a gasket is cracked? Compression test. How to identify if block is cracked? Has oil escaped UP into your coolant hoses? NOTES: Clear and rust coat the undercarriage near the AC drip line. (UNDER the BATTERY) This spot is known to rust out the idler arm. 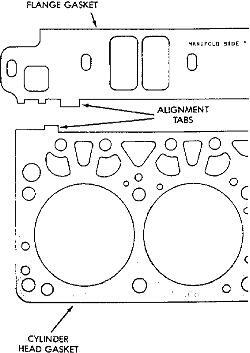 Q: How do you identify if the head/s are damaged or just a gasket is cracked? NOTES: Clear and rust coat the undercarriage near the AC drip line. This spot is known to rust out the idler arm. Before disassembling the cylinder head, you may want to fabricate some containers to hold the various parts, as some of them can be quite small (such as keepers) and easily lost. Also keeping yourself and the components organized will aid in assembly and reduce confusion. Where possible, try to maintain a components original location; this is especially important if there is not going to be any machine work performed on the components. If you haven’t already removed the rocker arms and/or shafts, do so now. Position the head so that the springs are easily accessed. Use a valve spring compressor tool, and relieve spring tension from the retainer. Due to engine varnish, the retainer may stick to the valve locks. A gentle tap with a hammer may help to break it loose. Remove the valve locks from the valve tip and/or retainer. A small magnet may help in removing the locks. Lift the valve spring, tool and all, off of the valve stem. If equipped, remove the valve seal. If the seal is difficult to remove with the valve in place, try removing the valve first, then the seal. Follow the steps below for valve removal. Position the head to allow access for withdrawing the valve. Cylinder heads that have seen a lot of miles and/or abuse may have mushroomed the valve lock grove and/or tip, causing difficulty in removal of the valve. If this has happened, use a metal file to carefully remove the high spots around the lock grooves and/or tip. Only file it enough to allow removal. If equipped, remove the valve spring shim. A small magnetic tool or screwdriver will aid in removal. Repeat Steps 3 though 9 until all of the valves have been removed. 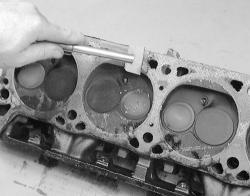 Lightly lubricate the valve stems and insert all of the valves into the cylinder head. If possible, maintain their original locations. If equipped, install any valve spring shims which were removed. 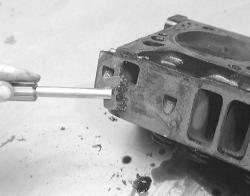 If the valve seal presses over the guide, lightly lubricate the outer guide surfaces. If the seal is an O-ring type, it is installed just after compressing the spring but before the valve locks. Place the valve spring and retainer over the stem. Position the spring compressor tool and compress the spring. Assemble the valve locks to the stem. Relieve the spring pressure slowly and insure that neither valve lock becomes dislodged by the retainer. Remove the spring compressor tool. Repeat Steps 2 through 8 until all of the springs have been installed.